PT PAL Indonesia (Persero) - PAL is a reputable state-owned strategic industry company in Indonesia with core business competencies in shipbuilding and engineering services. Established in 1980, PAL has its business activities focused in four sectors: merchant shipbuilding, naval shipbuilding, general engineering and repair and maintenance services. PT PAL Indonesia (Persero) is a non listed state-owned company and is fully owned (100%) by the Government which represented by the Minister of State-Owned Enterprises (SOE). 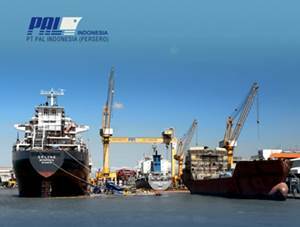 PAL is based in Surabaya East Java and now supported by 1 Jakarta representative office and 1 subsidiary, namely PT PAL Indonesia Marine Service (99.8% direct ownership). As of December 2014, PT PAL Indonesia (Persero) supported by 1,267 dedicated employees. Maximum age of 35 years old for D3 and S1. Maximum age of 30 years old for SMK. Education in accordance with the applied position. D3/S1 with minimum GPA of 2.85 for PTN and 3.25 for PTS. SMK with minimum average NEM/UN score of 6.5. Never dismissed due to disciplinary punishment. Willing to resign from working relationship with other institution if passed the selection. JobsCDC.com now available on android device. Download now on Google Play here. Please be aware of recruitment fraud. The entire stage of this selection process is free of charge. PT PAL Indonesia (Persero) - SMK, D3, S1 Regular Recruitment Program PAL June 2018 will never ask for fees or upfront payments for any purposes during the recruitment process such as transportation and accommodation.